Utilitarianism and Relativism research papers look at the similarities of these philosophy viewpionts. If you have a research paper on Utilitarianism and/or Relativism due and don't quite know how to organize, write or research it, Paper Masters will custom write your project for you. The research is written from any viewpoint you need discussed and can incorporate any level of philosophical thinking you need. Custom philosophy research paper topics are Paper Masters specialty. The thesis statement and topic you see here is just a sample of a philosophy term paper topic and of what we can provide you in research. Papers are always original and we guarantee each research paper. The ethical theories that inform your professional moral code. In this part you are to pick no more than two ethical theories that inform how you think regarding them. Divine Command - God's will is always right. Virtue ethics - teleological - the end result - ultimate good for a culture. Relativism as a theory rejects the idea that certain universal truths exist. Instead, it accepts the idea that there are many different ways of interpreting our world. A person’s objective truth is considered the best idea he has at the time for explaining what is occurring. Relativism proposes that there are no universally valid moral principles, because moral principles are only valid in terms to a specific culture and/or individual choice. Customs and choice dictate the development of moral values and morality can only be understood within that context. From a collective perspective then, Relativism suggests that public morality is a construct of social convention. The result is that and two people, or groups of people, can examine exactly the same action or behavior and one might consider it moral while the other considered it immoral. Relativism is not without its critics. Relativism as a theory was brought to the forefront of debate by people like Jean-Paul Sartre. Sartre’s extreme beliefs did not always win fans for the theory. For example, after Israeli Olympians were killed by a Palestinian organization, Sartre suggested that terrorism was a “terrible weapon but the oppressed poor have no others”(Bowman 2003, 7), and he found it “perfectly outrageous that the Munich French press and a segment of opinion should judge the Munich attack an intolerable outrage while one has often read dry reports without comment of strikes in Tel Aviv that cost several human lives” (Bowman 2003, 7). Sartre also suggested that the Nazis should not be judged by universal values if their values were relative to a different culture. These statements follow the rules of pure relativism, but while I support the Palestinians’ and even the Nazis’ right to posses their own personal moral tenets, my support for relativism does not extend to validate their actions against other human being. Sartre might have embraced existentialism, concerning himself more with abstract universal human qualities. But to me, ethics is more about practical application. According to the ethical doctrine of utilitarianism, the moral worth of any action is determined by its contribution to general utility. Utility is the good to be maximized and can be viewed as happiness, pleasure, good or the fulfillment of one’s preferences and desires. According to this theory a person’s decisions and actions should produce the greatest amount of good for the greatest number of people. And thus, the least amount of harm/evil to the greatest number. Utilitarianism governs individual actions, the utility of one act over another, and the utility of rules. Under the theory, for an action to be considered morally right it must produce at least as much good for all people involved as the possible alternative actions. In this way, utilitarianism can judge individual actions on how well they conform to the dictates of greatest good and least harm. Jeremy Bentham was one of the first to explore the idea of utilitarianism. Bentham believed that pleasure is the only good, pain the only evil. He acknowledged pleasures of the senses, property ownership, power, and interpersonal relationships, suggesting that pleasure and pain determine everything we do. Bentham advocated for changes in the legal system, particularly in criminal law, intending to maximize happiness for everyone. He suggested that criminal acts should only be those which are intentional and injurious, and in those cases punishment had to serve as deterrence and be severe enough to outweigh potential benefits of offense. On the other hand, he proposed abolishing imprisonment for things like indebtedness, which in his view was an offense which did not injury anyone. Kant and Utilitarianism - Kant and Utilitarianism Research Papers look at a sample of an order placed for a comparison between two philosophical approachs. 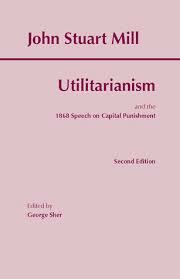 John Stuart Mill and Utilitarianism - John Stuart Mill Utilitarianism research papers discuss one of John Mill's most famous philosophical works that explores normative ethics. Mill, Kant, and Capital Punishment - Mill, Kant, and Capital Punishment Research Papers delve into Mills Utilitarian view of morality versus Kant's perception of the categorical imperative view. Pragmatism - Pragmatism has always had a large degree of utilitarianism in it. August notes that Mill had, before embarking on Utilitarianism, completed his System of Logic. Ethical Perspective - In an Ethical Perspective research project, three issues one may face when addressing ethical dilemmas in the workplace are discussed. Hedonists - Hedonists research papers examine the individuals who believe that pleasure is the only intrinsic good in life. Absolute Idealism - Absolute Idealism research papers discuss the philosophy that all life is part of a whole and, for the world to be known and understood by humanity, there must be thought and being. Pleasure Principle - Pleasure Principle research papers examine the foundations of Freudian psychology, the idea that the human being will instinctively seek to avoid pain and seek out pleasure in the drive to satisfy psychological and biological urges. The Subjection of Women - Subjection of Women by John Stewart Mill Research Papers explore the notion that the case for ending the subjection of women is daunting and yet his contemporary circumstances made it propitious for their emancipation. Unethical Corporate Practices - Unethical Corporate Practices Research Papers explore the basic theories of ethics, and how corporate culture influences companies behavior. On Liberty - Espoused liberalism and utilitarianism as well as championing individual's rights. On Liberty research papers, illustrate clearly Mill's ideas on individuality. Immanuel Kant - Mill, Kant, and Capital Punishment Research Papers delve into Mills Utilitarian view of morality versus Kant's perception of the categorical imperative view. Critique of Pure Reason - Mill, Kant, and Capital Punishment Research Papers delve into Mills Utilitarian view of morality versus Kant's perception of the categorical imperative view. Existential Psychology - Existential Psychology research papers discuss the form of psychotherapy that moves from the premise that an individual’s conflict is the result of confrontation with life, death, freedom and responsibility, isolation, and meaninglessness. Modern Philosophy - Modern Philosophy research papers on the introduction of modern philosophy, by Rene Descartes, that began in the 17th Century and lasted until the 20th Century. Simone de Beavoir - Simone de Beavoir Research Papers explore her belief in existentialism. Paper Masters writes custom research papers on Utilitarianism and Relativism and look at the similarities of these philosophy viewpionts.